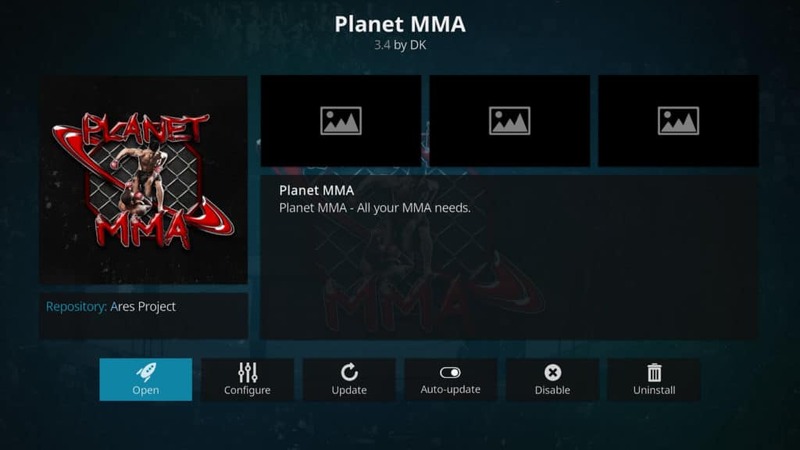 Planet MMA Kodi addon: Should you install it, is it safe? 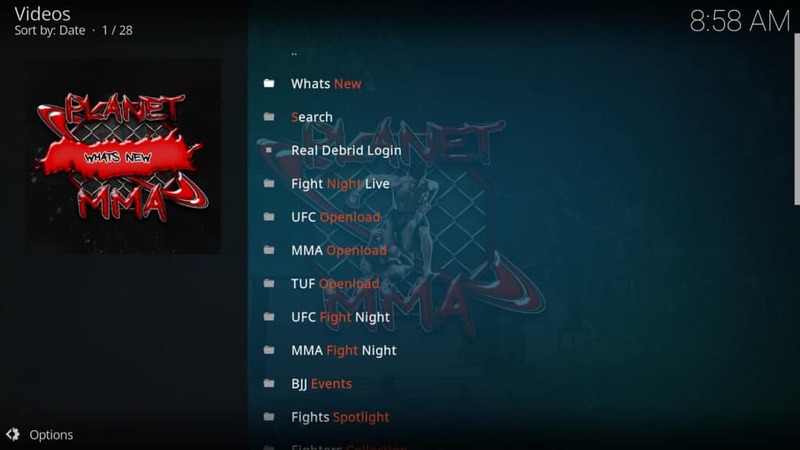 Looking for the Planet MMA Kodi addon? 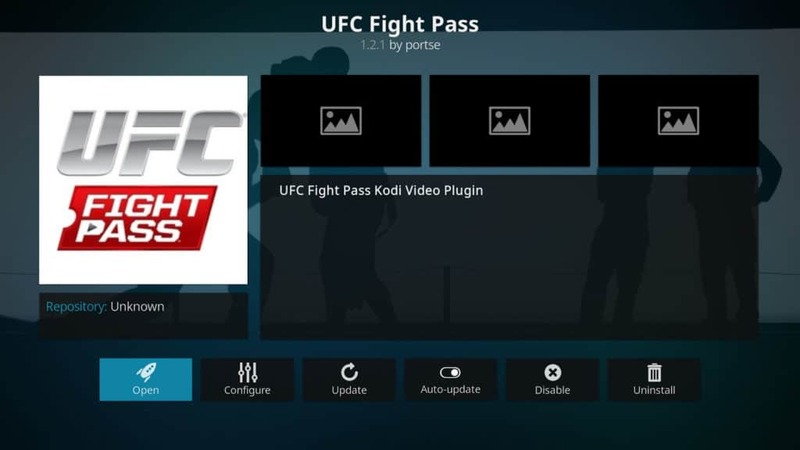 This guide takes a look into the Planet MMA Kodi addon and its alternatives. Kodi is a free software package that allows you to quickly and easily set up a home media center. It’s open source, responsive, and best of all, versatile. Kodi can be installed on several of the most commonly used platforms including Windows, Mac, or Linux PCs, iPhone, Apple TV, Roku, Amazon Fire TV, Firestick, Raspberry Pi, or even a simple USB flash drive. Of course, a media center is no use without any content to play. Kodi provides two ways of importing media. The first is by finding any video or audio files you have on your system’s storage. The second is by installing additional plugins, also called “addons.” These addons find links to content that is hosted online and deliver them to the user. One of these addons is named Planet MMA (previously known as UFC Finest). In this article we’ll be explaining what the Planet MMA addon is and how it works. We’ll also be covering some of the security and privacy concerns that all official and third-party Kodi addons share. Kodi has been on the receiving end of a lot of negative press recently, despite being completely legal to use. Much of this stems from the fact that some third-party addons have been providing access to unlicensed copyrighted content. What is legal in one location may not be in an another, and for this reason it is imperative that you research the laws in your country before attempting to use Kodi to stream content online. Many Kodi users employ a VPN to hide illegitimate streaming activities, however a VPN can help users of legitimate Kodi addons in several ways. Every Kodi addon, whether official or third-party is vulnerable to attack. Once compromised, there’s very little that a malicious third party cannot do to your system. They could intercept all of your communications, steal your online login credentials, or even install further malware on your computer in the hopes of forcing you to pay money for its removal. Hackers aren’t the only people interested in your browsing habits. Several large ISPs have admitted to or have been caught intentionally limiting the network speeds of their paying customers. This is often done automatically when the user is streaming video online and can happen regardless of how much money you pay. A VPN can protect you from both of these threats by encrypting all of the traffic to and from your computer. Any outsider looking in would see only a meaningless string of encrypted traffic. This protects you from hackers using Man-in-the-Middle (MitM) attacks, and as your ISP can’t be sure if you’re streaming or not, they are less likely to automatically throttle your network speeds. We recommend using IPVanish. It works with every Kodi addon we’ve ever tested and provides a fast and stable network connection. This can help reduce buffering and stuttering issues, thereby improving your viewing experience. IPVanish value their customer’s privacy very highly, which is why they keep no logs of their users’ traffic or browsing histories. You can even install it on an Amazon Firestick to remain protected when away from home. What is the Kodi Planet MMA addon? Planet MMA is a third-party Kodi plugin that offers access to content relating to mixed martial arts (MMA). It is what is known as a link scraper–an addon which gathers links to content from multiple sources and presents them to the user for easier access. The most obvious problem with this addon is that it offers access to unlicensed content, particularly pay-per-view fights. There is no way to disable illegitimate sources, and no way to login to an official provider. As such, this addon offers nothing to Kodi users who’d like to watch MMA legitimately. In order to watch any of the live events, you also need to install and update SportsDevil. This is another third-party addon with a similar focus on unofficial sources. Every addon you install slightly increases the risk of one of them being hijacked, and since there are multiple official ways to watch live events, this risk in wholly unnecessary. Additionally, while there is a search function included, it does not appear to work. As the list of fighters contains just eight entries, users are forced to browse by category. These categories are very unorganized, with much of the content appearing in multiple places and folders named things like “Random MMA.” This throws the reliability of the entire addon into question: even if Planet MMA did offer a way to watch content from official sources, it could take some time to find the title you’re looking for. For the reasons above, we do not recommend that Kodi users install or stream content with Planet MMA. Most third-party addons have at least a small selection of legitimate content, but Planet MMA offers none. This makes it unsuitable for people looking to stream officially licensed content. This doesn’t mean that there’s no way to watch officially licensed sporting content on Kodi, however. There are several official alternatives that are not only safer and more reliable, but completely legal too. UFC Fight Pass is the UFC’s official subscription service. It costs £5.99 ($7.94) per month and provides access to more than 10,000 on-demand fights. While the only live fights available are the UFC Fight Pass Prelims and fights from smaller leagues, UFC pay-per-view events are added 30 days after they air at no additional cost. The UFC Fight Pass addon was created by a developer named Portse. It requires a valid UFC Fight Pass email address and password to view most of its content, although there is a very small selection of free videos that you can watch without a subscription. While you can sign up for the UFC Fight Pass from outside of the US, some of its content is region-locked. You can bypass this by connecting to one of your VPN’s American servers. The UFC Fight Pass Kodi addon can be found exclusively in the Portse’s repository. Sportsnet Now is a subscription service offering access to live hockey, baseball, basketball, soccer, wrestling and more. While it isn’t primarily focused on MMA, there is a limited selection of UFC content available, with the option to pay more to watch pay-per-view fights live. This addon doesn’t provide much in the way of on-demand content. The only matches available are from the previous day, after which they are removed. As such, it’s more focused towards people who don’t have a cable TV subscription than someone looking to catch up. 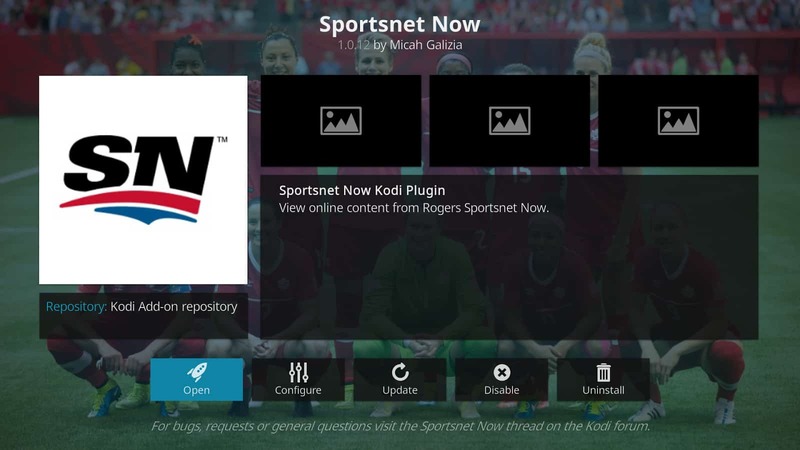 As Sportsnet is a Canada-based service, some content may be inaccessible in your country. This can be easily bypassed by connecting your VPN to a Canadian server in the region of the team you’d like to watch. Fox Sports Go is a subscription service which offers access to a wide range of live and on-demand sporting events including UFC and boxing matchups. It’s included at no extra cost with every Fox Sports subscription. While there are Fox Sports Go apps for a multitude of different devices, the unofficial Kodi addon allows you to expand this even further and watch live sports on anything from a cell phone to a Raspberry Pi. The Fox Sports Go addon does not include any free-to-watch content and requires you to sign in before any videos are shown. Fox is a US-based network, and as such, most of its content is unavailable in other countries. As with the other official sports addons, bypassing this is as simple as connecting your VPN to an American server. 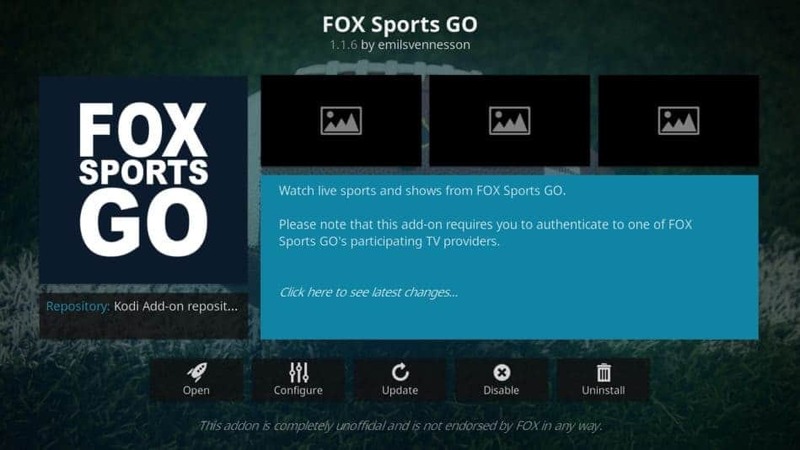 The Fox Sports Go Kodi addon can be found in the official Kodi addon repository. Planet MMA has a large selection of content, but none of it is officially licensed. If everyone watched pay-per-view events for free, the people who create this content would have no incentive to do so, so by using an addon like Planet MMA, you may be harming the industry as a whole. Because it’s a third-party addon, Planet MMA is unlikely to have been created with the same stringent quality assurance processes and rigorous testing procedures than an official addon would have. As a result, there may be a greater number of unpatched vulnerabilities that a malicious third party could exploit to gain access to your system. We’ve shown that there are several official addons available that offer more reliable access to the same content that Planet MMA does, but with a far lower risk. There’s also no chance that their content could be taken down by a copyright claim, and no risk of falling foul of local copyright laws yourself. For these reasons, we recommend Kodi users who are looking for MMA content use one of the legitimate alternatives above instead of Planet MMA. Thank you so much for the update about using Planet MMA. VERY helpful information about using a different addon.